Wild fires are normal. They are nature’s way of clearing out the old vegetation to allow for new growth. Consequently most forests, woodlands, savannas and grasslands are all prone to fire on occasion. The two words, wild and fire, have sterner connotations for us. Wild suggests out of control, dangerous and unpredictable, whilst fire is a tamed killer, capable of harm any time we drop our guard. The combination is just scary. In Australia the threat of is very real. The Blue Mountains west of Sydney are a designated world heritage area, famed for sandstone cliffs and scenery set among huge tracts of eucalyptus forests. The tall gum trees give off wax that creates a kind of haze making the hillsides appear blue. Along the arterial route that crosses the mountains from the Sydney basin to the farming country spread wide across the west there is a ribbon of villages and small towns. Flammable gum trees, various species of the genus Eucalyptus, surround these settlements. These trees are remarkable in that they are not easily killed by fire. Leaves burn, twigs and branches are lost but boughs survive and after a wildfires new shoots sprout from the charred trunks. 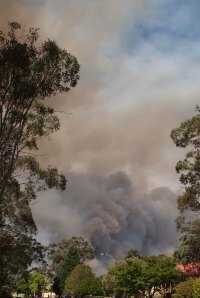 It is called epicormic growth and either evolved after fire or, more likely, gave the eucalypts the competitive edge when fire frequency increased. Around the villages in the Blue Mountains are boards designed like a barometer with movable arrows that indicate the current fire hazard – the likelihood or risk of a wild fire happening today. The highest level of risk used to be ‘extreme’, now a new category has been added ‘Catastrophic’. This new category was created following devastating wild fires in the state of Victoria a thousand kilometers to the south. On the 7 February 2009, Black Saturday, 173 people died and 414 were injured when wild fires overran homes and settlements. The fires burnt so hot and were moving so fast that anything in their path perished. An impact of climate change will be that the intensity and/or frequency of these events will increase for many areas. Fires need fuel and some wind energy to power them. They occur when plants have grown, dropped leaves and twigs that have dried out. Then on a hot day with gusty winds all you need is a spark. Walk through a gum tree forest on a summer day and all these elements are there, especially when it has been dry for a while. Under climate change scenarios rainfall is expected to vary more than it has done in the past. There will still be rain and rainy periods sufficient to promote plant growth, but there will also be dry periods, extensive dry times that extend the suitable conditions for ignition and spread. Drier forests are not only at a greater risk of ignition but they also burn more intensely. Hot fires also more easily run out of control. This increases risk to property, lives and the human and financial cost of recovery. This increased threat does not stop people living among the trees but it does make the consequences of wildfires more severe. < What is the climate change effect?